Last Friday I had the pleasure of participating in a SolidWorks 2009 Roundtable discussion podcast over at SolidWorks Heard!. The podcast episode has been posted and you can listen to it by clicking HERE. Thanks to Lou Gallo of SolidWorks Heard! for inviting Josh Mings (SolidSmack), Jason Raak (Rocksolid Perspective), and myself to participate in a discussion of the new features in SolidWorks 2009. Mike Puckett and Alex Ruiz were scheduled to be there but couldn’t make it due to some last minute conflicts. 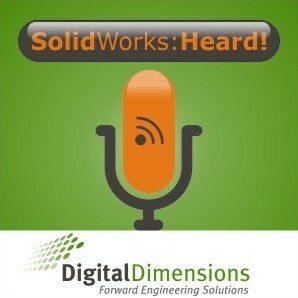 If you are an iTunes user you can Subscribe to SolidWorks Heard! for your iPod, iPod Touch, or iPhone. Lou has been by far the most prolific SolidWorks “podcaster” around. Check it out! Dell M6400 with Windows 7! SWUGN Technical Summit Nashville: Registration is now LIVE!